We’re back at it again this week, and we brought friends! 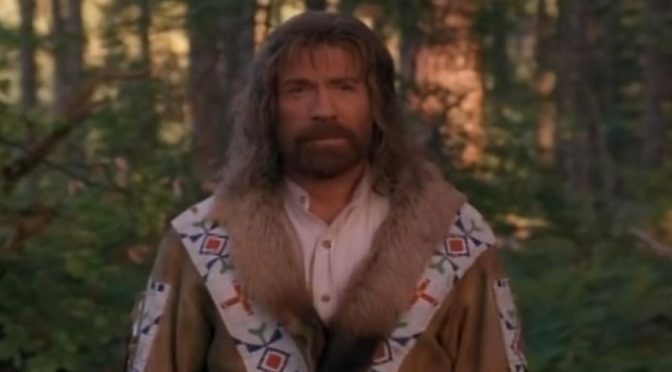 It was Brittany’s pick this week, and she took us in a real weird direction by choosing the 1996 kid’s fantasy-adventure, Forest Warrior… Starring the one and only, Chuck Norris. And in a rare Second Class Cinema occurence, we had not one, but TWO guests on to discuss this week’s movie. So, welcome our pals Aaron and Tyler back to the show! Forest Warrior follows a ragtag group of kids who go on a camping trip, only to discover that a greedy lumber tycoon is seeking to illegally deforest their beloved mountain. In a desperate bid to save it, they team up with a mythical, shape-shifting, mountain man (played by Chuck Norris) to take down Thorne by any means possible… Like hijacking their walkie-talkies, hijinx with fishing poles, and calling upon their animal friends for help. Can they defeat Thorne and save the mountain before it’s too late? They can if Chuck Norris’ mullet has anything to say about it! Listen up as we discuss clapping bears, Chuck Norris breastfeeding a raccoon, and the power of rock & roll! LOOK! LOOK! We have podcast friends! Check out the Box Office Boyz!